On Saturday, Minneapolis City won the NPSL North Conference title by beating last year’s champions Duluth. The emphatic 4-2 victory ended the title race, but things are still wide open for the second playoffs place. The match itself was a brilliant advertisement for NPSL soccer. The home fans were thunderously loud all game. There was a small traveling contingent of Duluth fans who made some noise each time their team pulled one back, encouraging even more noise from the City side of the stadium. The level of play was high and the match was competitive. There were goals galore, a penalty save, and the victorious City team singing to the home fans after the game. The match itself was a tactical masterclass from Adam Pribyl. Duluth had clearly set-up to press the Crows midfield. Expecting that, Pribyl had cannily withdrawn forward Tim Wills into the attacking center midfield role, flanked by three very fast forwards in Nick Hutton, Will Kidd, and Justin Oliver. Wills found space between the lines and the first half was largely a case of Wills with the ball at his feet trying to choose which streaking striker he wanted to pick out. The 2-0 halftime lead was very much deserved, if it took a penalty save to seal it. The less that is said about the mix-up that caused the penalty the better, but enough cannot be said about Matt Elder saving from Joe Watt. Elder has faced two Duluth penalties in two years, saving them both. 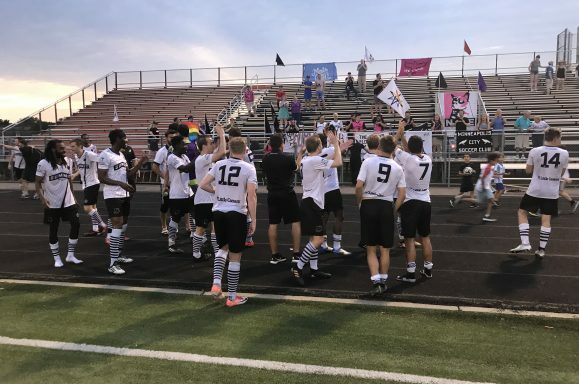 Duluth are a never-say-die team, their team cohesion being a major factor to their success, and they scored just a few minutes into the second half to make it a game. The new style that Joel Person has Duluth playing can be very pleasing to watch, in fact, both of the Duluth goals were the punctuation on spells of pleasing possession. However, all too often, Kyle Farrar, the premier striker in the conference last season, was isolated and ineffective. With fellow original Tom Corcoran withdrawn at halftime, it remains to be seen what the future is for the Donkeys. Minneapolis City, however, were in no mood to let the game slip. Justin Oliver scored to re-gain the two goal lead, a lead reduced once again to a single goal following another Duluth strike. A Will Kidd goal once again restored the two goal lead. The win means that Minneapolis City wrapped up the conference title with a game to spare. The Crows remain unbeaten this season and have already set a new record for points in a season, again with a game still to play. It has been an impressive season from the Minneapolitans. The title race is over, but do not look away from the NPSL North during the final weekend of the season. Three teams have a shot at the final playoff place with two of them, Duluth and Med City, facing off on the final day. For Med City, this is an opportunity for catharsis. Last season the Medics, after leading the conference for most of the summer, lost at home to Minneapolis City. That loss bounced them from the playoffs. While they do not entirely control their playoff destiny, even if they beat Duluth they need St. Paul’s VSLT FC to drop points in one of their final two games for Med City to sneak in, they do control Duluth’s playoffs destiny. The potential symmetry of Med City downing Duluth, in Duluth, on the final day of the season to deny them a playoff place enhances an already extremely tasty match-up between these two. There is no love lost between the teams. An ill-tempered match last season, with Duluth controversially running out late winners, and a hard-fought draw this season, set the stage for an explosive season finale. Keep an eye on VSLT, a side which, while they have had a very rough week, and will have to rely on Duluth losing, are still very much in the playoff picture. Defeat to Minneapolis City was followed by a shock defeat to Sioux Falls, with the club’s Twitter account lamenting the lack of commitment from certain players (apparently, VSLT could only muster 13 for the trip to South Dakota). The Sky Blues still have to play La Crosse and Minnesota TwinStars and they need to win both. Any dropped points, or a win by Duluth, and VSLT are eliminated from playoff contention. Looking ahead to the regional playoffs is daunting. AFC Ann Arbor must be the favorites. The Mighty Oak have already won the viciously competitive Great Lakes Conference and are no strangers to the playoffs. They boast a Kenyan U21 international, a number of top Division 1 players, and two players among the best in the Midwest in their positions, forward Kyle Breitmeyer and goalkeeper TJ Tomasso. The final playoff spot out of the Great Lakes Conference will either be Grand Rapids or FC Columbus.Both have the power and discipline to do well in the playoffs. Such is the strength in this region that North Conference teams are right to fear Erie Commodores, who have a history of success (2009 National Runner-Up, 2011 National Third Place, 2013 National Semi-Finalists), Cleveland SC, aka the re-born and re-branded 2016 National Champion AFC Cleveland, or Fort Pitt Regiment, any of which could still make the playoffs, though it is the first two that seem most likely to do so. If Minneapolis City beat Dakota Fusion this Saturday, they will have a bye into the Midwest Region semi-final. That will be critical for the Crows. They have had a long injury list throughout the season and an extra week will work wonders for guys like Ben Wexler, Branden McGarrity, and Isaac Friendt who were hurt early in the season and are expected back. It also will not hurt for players like Martin Browne who picked up a slight knock later in the season. A full strength City team surely is not a favorite, but should be able to do the North proud. They need the bye. While each of Duluth, VSLT, and Med City are improved from last season, having watched video of the playoff-bound teams from other conferences, they have not improved enough to strike fear in any of their opponents. Without a bye, the second place team will have to contest a play-in round against the closest playoff team geographically that did not receive a bye. The host will be determined by PPG. The scenarios are all over the place as they depend on results across the board, but Duluth is not terribly placed should they beat Med City. The other teams in contention, however, should they make the playoffs, are most likely going to have to make a weekend trip to Grand Rapids, MI or Columbus, OH. Too much remains up in the air to prognosticate with certainty beyond saying that the playoffs are a huge step up from the standard North Conference level of play. Minneapolis City, if healthy, could do some damage, but the challenge looks to be too much for the conference’s second placed team.